Eddie Campbell (born 1955) is a Scottish comics artist and cartoonist who now lives in Australia. Probably best known as the illustrator and publisher of From Hell (written by Alan Moore) - a comic version of the Jack the Ripper crimes. Campbell is also the creator of the semi-autobiographical Alec stories, and Bacchus (aka Deadface), a wry adventure series about the few Greek gods who have survived to the present day. Campbell's scratchy pen-and-ink style is influenced by the impressionists, illustrators of the age of "liberated penmanship". His writing has been compared to Jack Kerouac and Henry Miller. This new acquisition has a link to the Wagga region, simply by virtue of its title: by the time i get to WAGGA WAGGA. 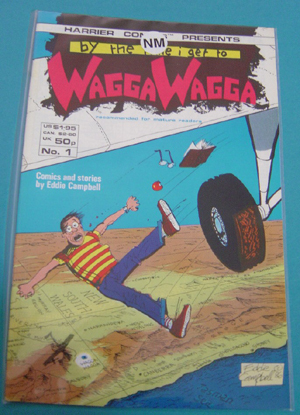 The cover illustration depicts a rough map of the Wagga region, with a 'Where's Wally' type character falling towards it from a plane. This comic is a good example of the work done by graphic novelist and illustrator Eddie Campbell. It is one of a number of quirky items which use the name Wagga Wagga in their title, but seem to have little to do with the place itself. Campbell's quirky comic exemplifies the number of books or plays which use the town of Wagga Wagga as a setting - for example the books Mud Crab Boogie and Men are From Wagga and Women Wish They Weren't.